Using the supersharp radio "vision" of the National Science Foundation's Very Long Baseline Array (VLBA), astronomers have made the most precise measurement ever of the distance to a famous star-forming region. The measurement -- to the heavily studied Orion Nebula -- changes scientists' understanding of the characteristics of the young stars in the region. opposite ends of Earth's orbit. "This measurement is four times more precise than previous distance estimates. Because our measurement reduces the distance to this region, it tells us that the stars there are less bright than thought before, and changes the estimates of their ages," said Geoff Bower, an astronomer at the University of California at Berkeley. Bower, along with Karin Sandstrom, J.E.G. 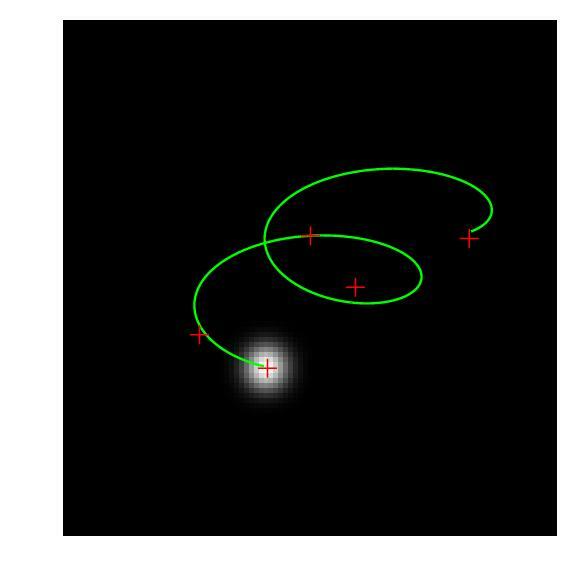 Peek, Alberto Bolatto and Richard Plambeck, all of Berkeley, published their findings in the October 10 edition of the Astrophysical Journal. The scientists determined the distance to a star called GMR A, one of a cluster of stars in the Orion Nebula, by measuring the slight shift in the star's apparent position in the sky caused by the Earth's motion around the Sun. Observing the star when the Earth is on opposite sides of its annual orbit allows astronomers to measure the angle of this small shift and thus provides a direct trigonometric calculation of its distance. "By using this technique, called parallax, we get a direct measurement that does not depend on various assumptions that are required to use less-direct methods," Bower said. "Only a telescope with the remarkable ability to see fine detail that is provided by the VLBA is capable of the measurement we made," he added. "Knowing the accurate distance to this region is vitally important to properly understanding the general characteristics of the star-formation processes there," Sandstrom said. 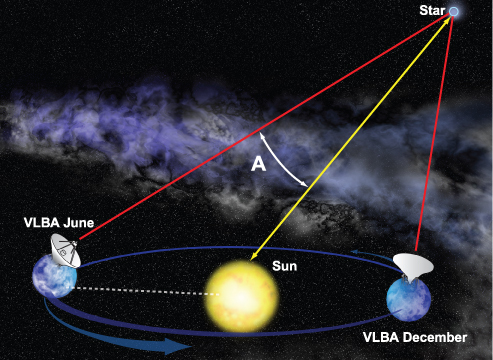 The new distance to the region, determined with the VLBA, is 1270 light-years, compared with the best previous measurement of 1565 light-years. 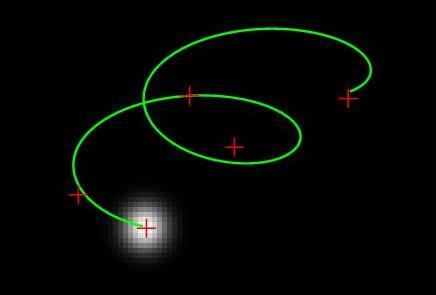 The old measurement had an uncertainty of about 17 percent, while the new VLBA measurement has an uncertainty of 6 percent. Because the newly-measured distance to the region is 20 percent closer than the earlier measurement, the stars in the region are intrinisically fainter by a factor of 1.5. This has a major impact on scientists' understanding of their ages. "These stars are nearly twice as old as previously thought," said Bower. "Getting a more-accurate distance is going to pay off in many ways by improving our understanding of what is one of the most frequently-studied star-forming regions in the Universe," Peek said. "By using the same technique on other stars in the region, it would be possible to build up a three-dimensional picture of the area," he added. The VLBA, a system of 10 radio-telescope antennas stretching from Hawaii to the Caribbean, provides the best ability to see fine detail, called resolving power, of any astronomical tool in the world. The VLBA can routinely produce images hundreds of times more detailed than those produced by the Hubble Space Telescope. The VLBA's tremendous resolving power is what permits the astronomers to make the precise distance determinations. In addition to the new measurement to the Orion star-forming region, the VLBA has made precise distance measurements to star-forming regions in the constellations Taurus and Ophiuchus, to a number of pulsars within our Milky Way Galaxy, and to one of our Galaxy's spiral arms. In 1999, astronomers using the VLBA announced the most precise distance measurement to a galaxy that is not a satellite of the Milky Way. That measurement allowed scientists to refine other, more indirect techniques used to determine distances throughout the Universe.